Novella collections are truly catching fire. One large book filled with smaller stories that you can begin and finish in one setting? The idea has readers grabbing up these books, and I'm super excited to bring you this newest collection from Barbour in which one of my friend's had her debut published! Here's a short blurb, and we'll chat on the other side! Come along on a romantic journey jam-packed with all the angst of marriages founded upon practical choices as well as coercion. Meet nine couples who barely know each other before they find themselves suddenly married to please family, to stem the tide of gossip, to save the land and joined for life. But can love grow when duty comes before romance? While all the titles in this collection look great, I'd be lying if I didn't say Rebecca Jepson's was my favorite. I had the pleasure of meeting Rebecca a few years back at a writing conference, and at the time she'd just been represented by her agent. That her story found a spot in this novella collection doesn't surprise me at all. Rebecca's story is titled A Highbrow Hoodwink, and when the black sheep of a family meets a sweet girl with a backbone, the resulting story is filled with laughter, love, and sparks. Rebecca packs a lot of character development and a strong-moving plot into the few pages her novella spans. The story leaves you happy while also hopeful that more novellas and books will be published by this new author. 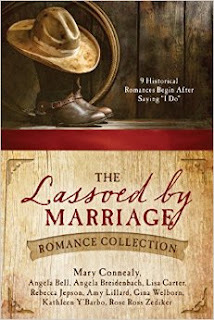 I happily recommend this as a great weekend read to anyone who loves historical romance, and you can purchase a copy here. Happy reading, friends!